If you missed out on squeezing in one last trip before the end of summer or have started to feel some serious wanderlust now that the leaves are changing, then it looks like now could be your chance at skipping town this fall, thanks to some seriously cheap plane tickets. Fresh on the heels of a three-day sale from Southwest Airlines, JetBlue just launched a two-day flash sale on Thursday with dozens of flights starting at $59. 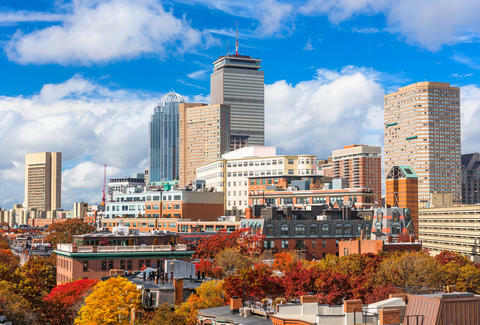 From now through September 29, the airline is offering several discounted one-way fares connecting southeast cities to several northeast cities with spectacular autumn colors, the most expensive of which is $99. JetBlue's official flash sale site has the full list of available flights, including highlights like Atlanta to Boston for $59, Jacksonville to NYC for $59, and Orlando to Baltimore for $59. But if leaf-peeping isn't your thing, you can also get from Fort Lauderdale to New Orleans for $59, too. You just have to snag the cheap tickets before they're gone. Like with every JetBlue flash sale, this one comes with some fine print you should consider before you start packing all of your flannel shirts. Specifically, you'll have to travel between October 11 and December 20, although there are a bunch of blackout dates in late November. Oh, and the sale only applies to "Blue" fares, so if you want to check a bag it's going to cost an extra $25, and $35 for a second bag. All said, fall isn't exactly the most ideal time to travel, but between the changing leaves, all the PTO days you haven't used yet, and the looming threat of stressful holiday travel, you have at least three reasons to try. Best of luck. Tony Merevick is Senior News Editor at Thrillist and could really use a quick getaway right about now. Send news tips to news@thrillist.com and follow him on Twitter @tonymerevick.